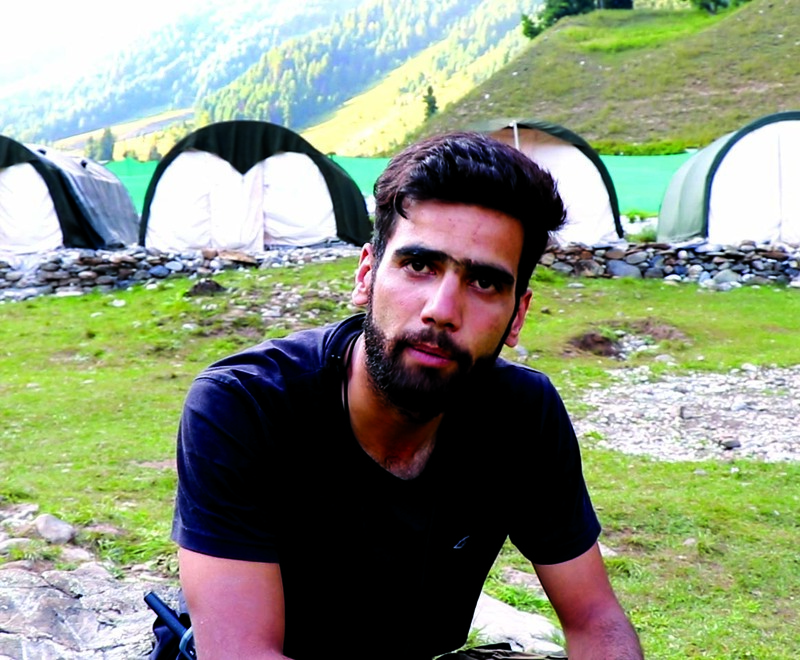 If you are not an athlete you might need to take a break at the make-shift bridge Abdul Basit Shah, 21, and his friends have made over a gushing brook in Lashpathri, Sonmarg, around 100 kilometres from Srinagar. This suspension bridge, made with wooden planks and ropes, is the only way to access base-camp of Team Mountaineers, an initiative Basit has launched in May 2017. The camp-site is dotted with rows of tarpaulin tents, which Basit himself designed. Once inside the large compound, spread over 10.5 kanals of lush green meadow, owned by his family, a sense of relief overtakes you. In a corner, young school girls, wearing colourful track-suits, ready themselves under the afternoon sun for a day’s trekking. A resident of Chrar-e-Sharief, when Basit was in Class IX, he recalls watching buses pass by his hometown carrying students of elite Srinagar schools on expeditions. “I used to get fascinated by just watching them pass,” recalls Basit. However, the idea had to wait till Basit finished his Bachelors in Business Administration (BBA) from the Islamic University of Science and Technology (IUST) in August 2017. Once the convincing part was over, the real challenge for Basit begun. “I wanted to get registered with the government so that I get land on lease for erecting camps,” said Basit. In early 2017, while he was still pursuing BBA, Basit started chasing around government offices to get the required paperwork done. “But after moving around for months, I was nowhere,” recalls Basit. Then, Baist requested his father and uncle, who jointly owned 10.5 kanals of land in Lashpathri, Sonmarg, to allow him to use it for his venture. “They were happy to help me,” said Basit. After college, Basit spent his idle time in designing tents for his site. “It took me two months to get the necessary permission from tourism department,” said Basit. The day Basit got permission from the Tourism Department he straightaway drove to Sonmarg with camping material and started working on the base-camp. Once the work on base-camp was done, Basit started convincing schools to send their kids for expeditions. “I started from my own school in Chrar-e-Sharief,” recalls Basit. It took Basit almost no effort to convince principal of his alma mater, Life School, Chrar-e-Sharief, to send the first batch of students for a four-day camping expedition. “We have been discussing this idea for a long time. So it was easy to convince him,” recalls Basit. Also, being a local helped Basit as most of the parents knew him personally. As Basit met the parents of Life School students, he realized it was easy to convince them to allow their kids for such an expedition. “What I couldn’t do in my school time, I wanted these kids to experience,” said Basit. 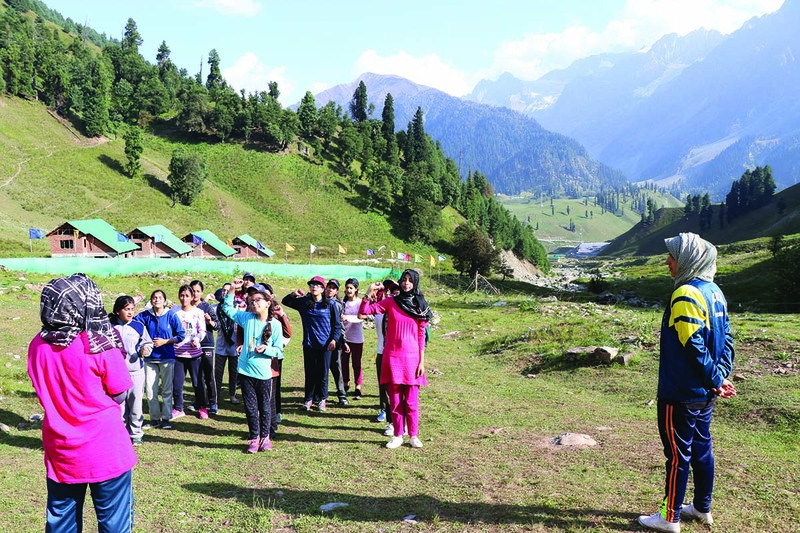 Finally, on a summer morning, 27 girls from Life School arrived for a four-day expedition at Lashpathri, Sonmarg. “I was both excited and nervous,” recalls Basit. Abdul Basit Shah at his camp site in Sonmarg. After the first group of girls left, Basit’s team welcomed forty-five boys from the same school. “We host girls and boys separately from a single school,” said Basit. It took lots of efforts from Basit and his friends to create an ideal itinerary for students included exercise on local tracks to get them familiar with their surroundings. “This is for the first day’s stay at the camp,” said Basit. Since the inception, Basit’s team has handled seven local schools and seven independent groups from areas other than Srinagar city. But the most challenging task so far was to conceive and handle an all-girl expedition. “It was a crazy idea given the place we live in, but we still did it,” said Basit with a hint of pride in his voice. However, Basit excitement proved short-lived as there was a catch; he was requested to convince their parents. “Almost every single girl wanted me to convince her parents,” said Basit. As the idea of an all-girl expedition was close to Basit’s heart, he started making calls to convince their parents, but without any luck. “In the end, only five girls could come,” said Basit. On August 4, 2017, Basit’s team received these girls at the front gate of his camp in Sonmarg. “It was an emotional movement for them as no one has ever been on a solo trip before,” said Basit. Interestingly, three out of five girls were from Kupwara, including a doctor, who wanted to take a break from her hectic lifestyle before she would change her profession. 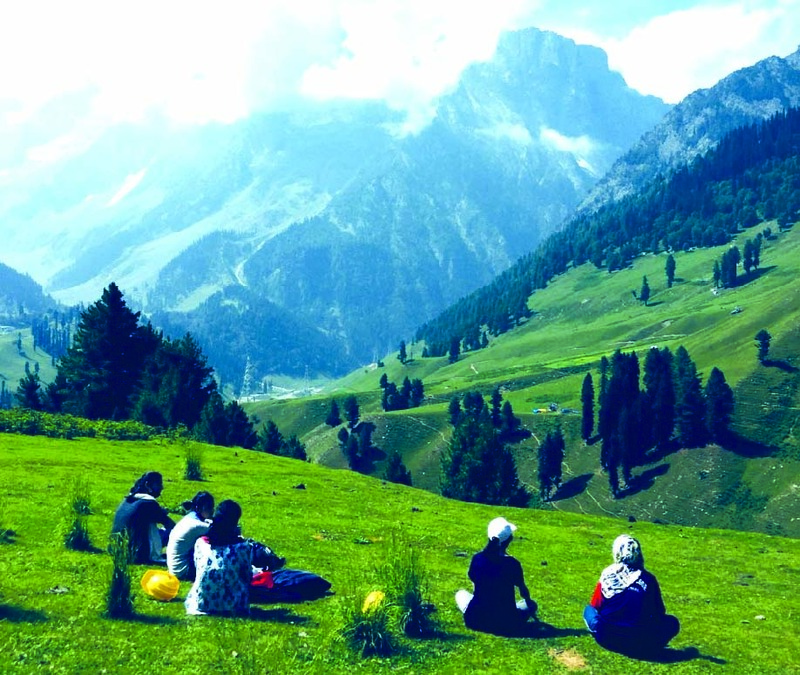 Members of solo girls group who spent four days in Sonmarg. The other girl, also from Kupwara, had an interesting story to back her presence in the hills. She had suffered heart-attack twice, and for that reason was denied a chance to go with her classmates on any trip during her school days. Hina, who had her sister along on the expedition, had never been away from her home for a single night without her parents. “It was a lifetime experience. I was free. I could have never imagined myself doing this but I am thankful I went on the trip,” said Hina with excitement visible in her voice.